Recently, I’ve been cooking quite a lot with lemons. I cooked them with salmon, pasta, chicken and also juiced them up to reap their health benefits. I just love the smell of lemons, so fresh and citrusy! 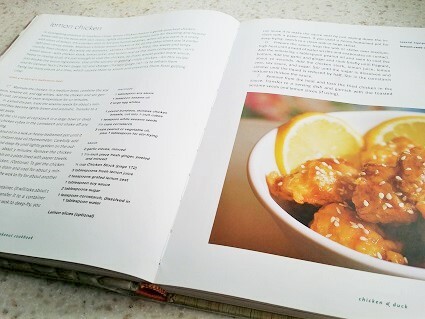 So, when I saw this Chinese lemon chicken recipe in The Chinese Takeout Cookbook by Diana Kuan, it immediately piqued my interest. The way that I usually cook lemon chicken is slightly different from the recipe in this book so I thought it would be interesting to try this version. I used a combination of chicken breast and thigh for this recipe. Personally, I prefer to eat chicken-on-the-bone so the next time I cook this, I’ll only use the thighs. I confess that I don’t cook fried food a lot so when I cook something deep-fried, it had better be worth the effort and extra calories for me. This Chinese lemon chicken recipe hits the right notes with the bird fried till crispy and then coated with tangy, sweet lemon sauce. With fried food, I like to have something fresh and preferably fruity on the side to sort of balance things out so the combination of fried chicken with lemon sauce is perfect. If you love fried food but not the messy clean-ups, you may want to consider investing in an air fryer. An air fryer eliminates the use of oil completely as it uses hot air circulation to cook, provides easy clean up and you can cook all kinds of food like frozen nuggets, french fries, chips, chicken tenders, roasted nuts and so much more! This Philips air fryer from Amazon has many positive reviews and is worth checking out. Adjust the consistency of the sauce if you’d like it thicker or thinner. You can also double the quantity of the sauce ingredients if you want more sauce. Ready for the recipe? Note: If you’re using chicken thighs, make sure to debone them. Get the butcher to do it for you to save you time. 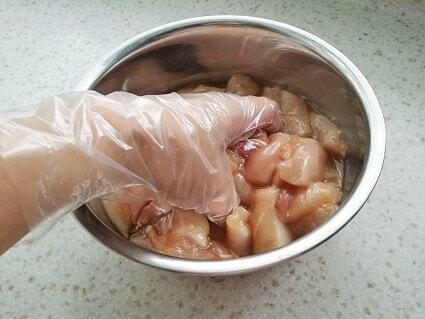 I also request the skin to be removed and I keep the bones in the freezer to make homemade chicken stock. If you find that the chicken is too thick, pound it with a meat mallet between two sheets of plastic. Then cut the chicken into bite-size pieces. Pour the marinade onto the chicken pieces and mix well. I like to massage the marinade in with my hands. Cover and let it sit for at least 10 minutes. Put in the fridge if you’re making it a few hours later or the next day. 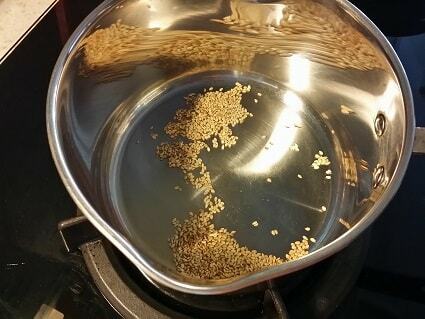 Lightly toast the white sesame seeds in a dry frying pan or saucepan on low flame. Transfer the seeds to a small bowl and set aside. Prepare your sauce. In a saucepan, heat up a tablespoon of oil. Swirl to coat the bottom. 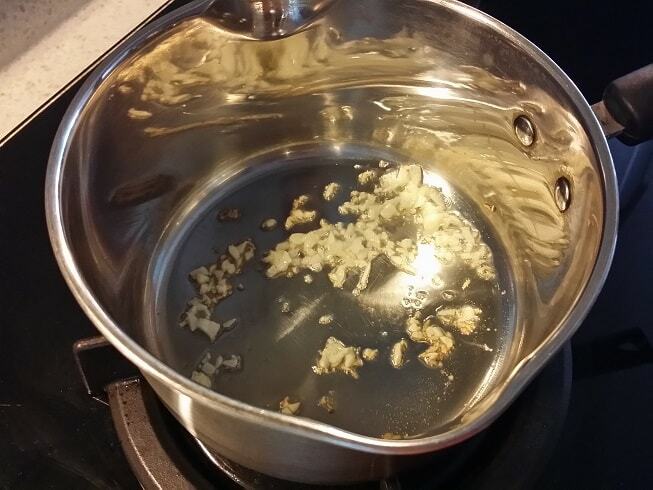 Pour in minced garlic and cook briefly for about 30 seconds till fragrant. No need to brown. Add chicken stock, lemon juice, lemon zest and sugar. Stir and bring it to a simmer. Do a quick taste. Add more sugar if it is too sour. Then slowly pour in cornstarch slurry to thicken the sauce to your preferred consistency. 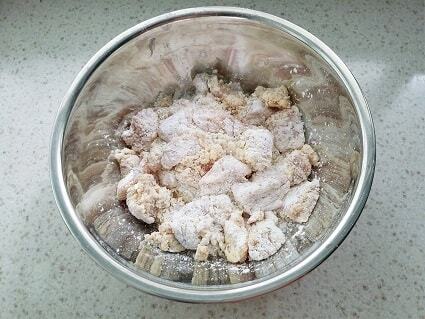 To fry, dip the chicken pieces into the beaten egg first and then coat with the all purpose flour. Heat up oil in a wok or large skillet over medium-high heat. 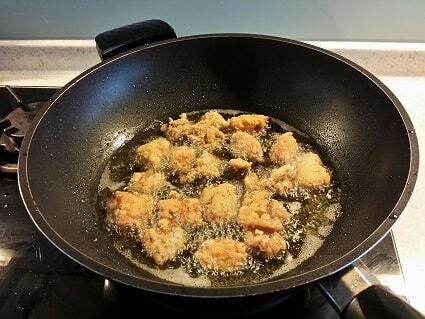 Once hot, carefully add the chicken pieces into the wok and deep-fry 2-3 minutes on both sides until golden brown. Do this in 2 or 3 batches and don’t crowd the wok. Let the oil heat up again before putting in the next batch. Don’t overcook the chicken pieces or the meat will be tough. Remove the chicken with a slotted spoon and drain on the slotted spoon itself for a while with a plate lined with paper towels below. Pour lemon sauce over the chicken and coat well just before serving. Sprinkle the toasted sesame seeds and lemon slices (if using). 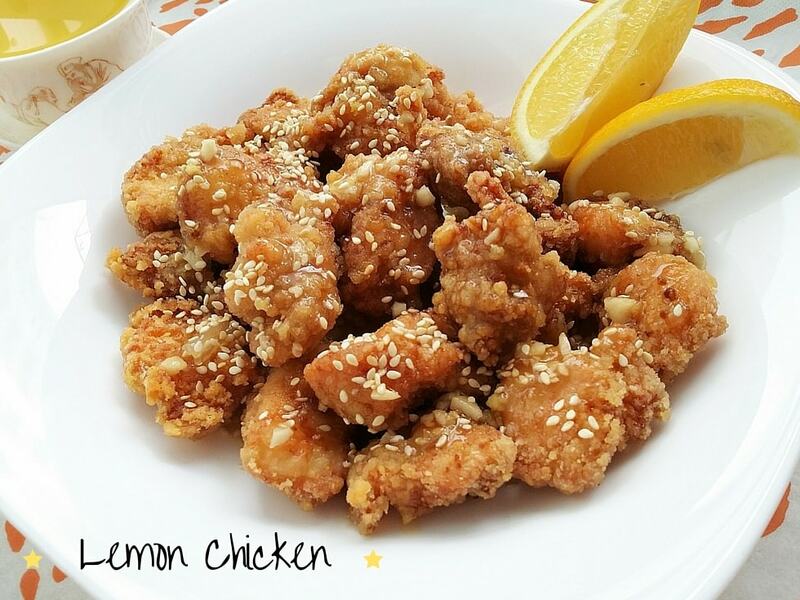 Serve this yummy and appetizing Chinese lemon chicken on its own or with a simple stir-fry and rice. And wash all this down with a healthy green tea or easy quick boil soup. Want more recipes like this? 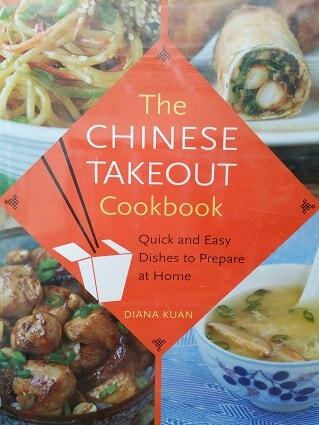 Then grab a copy of Diana Kuan’s The Chinese Takeout Cookbook for more of her delicious recipes! 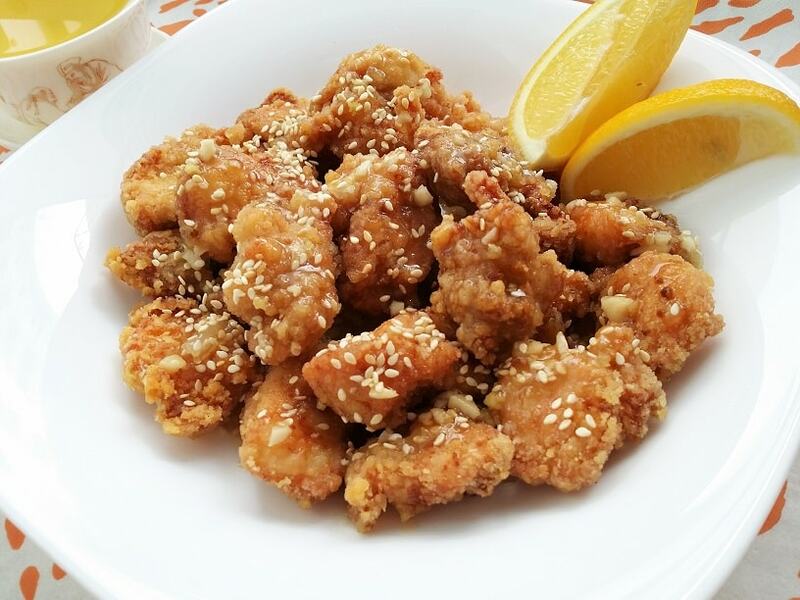 A delicious and appetizing dish of chicken fried and then coated with tangy and sweet lemon sauce. Cut the chicken into bite-size pieces.Pour the marinade onto the chicken pieces and mix well. I like to massage the marinade in with my hands. Cover and let it sit for at least 10 minutes. Put in the fridge if you’re making it a few hours later or the next day. 1. If you’re using chicken thighs, make sure to debone them. Get the butcher to do it for you to save you time. 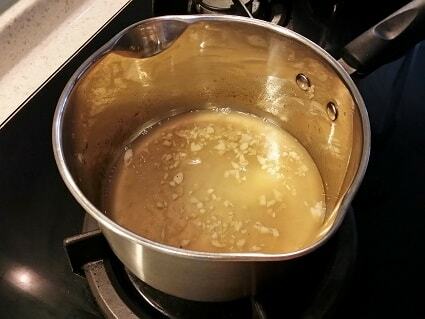 I also request the skin to be removed and I keep the bones in the freezer to make homemade chicken stock. 2. 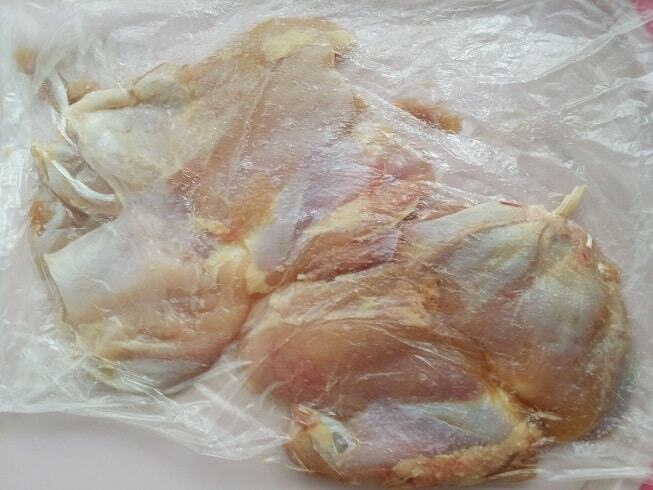 Pound chicken between 2 sheets of plastic if it is too thick. I am right there with you: I love lemons! I start every day with a glass of water with fresh lemon juice. It hydrates me well first thing in the morning. I love cooking with lemons too. I often saute vegetables, such as bok choy, with lemon juice. I love the fact that you just cover the chicken with the sauce as soon as you are done frying it. It would make it easy for the chicken to absorb the sauce and its flavor. 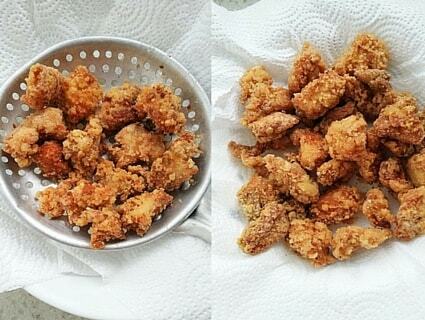 I am also thinking that it helps cut through the heaviness of fry part of the recipe. Makes the recipe feel lighter. Great recipe and your instructions are really clear. Thanks. I will give this a go. Is it essential to use sesame oil or could olive oil work? I prefer to use olive oil for health reasons, though I’ve just looked up sesame oil and it has quite a good fatty acid balance – better than safflower or sunflower which are high in omega-6s. Thanks. Sesame oil is optional but if you have it, you can add some. I would not use olive oil for this recipe. It’s like taking the restaurant and putting it in your home. I’ve tried several recipes and yes I liked them, but none quite get it, if you know what I mean. 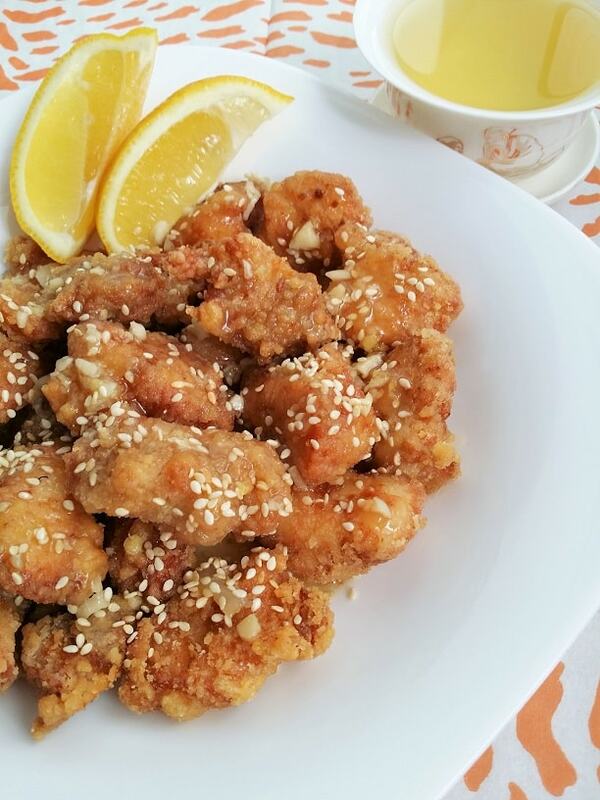 This Chinese lemon chicken recipe is spot on! Glad you shared this for everyone!